You’ve taken the big leap and started an Etsy shop. You’ve created an awesome product and you’ve gone through the confusing steps of creating your first Etsy listing. Give yourself a huge pat on the back because many makers don’t make it that far. But your first listing is just the beginning. So what really happens next? Etsy listings build momentum over time. It can take time to build that initial momentum that will help you start to see consistent sales. So you’re going to likely be waiting a bit before your first sale happens. I know this part can be frustrating because you’ve put in a good amount of effort already and it’s hard to be patient. If you have family and friends who you think might want to help support your venture, reach out to them. You can create a special discount code to give them extra incentive to make a purchase. Try Etsy Promoted Listings. Promoted listings are ad spaces that help boost your products placement in the search results. Create social media accounts for your business and share your new listings there. A Facebook page is a great place to get started. Try introductory pricing where you start your product off at a lower price. Make sure that the regular price is listed so that buyers understand the value of the product. I list the introductory price in the image as seen below and at the top of the product description. Mention that the introductory price is available limited time only to encourage buyers to act quickly. Many sellers have no clue what SEO is or why it’s so important. If that’s you, no worries. Search engine optimization is something that everyone struggles with but it can make a huge difference in your shop. Take the time to read through my SEO articles here on the blog and you’ll be well on your way to learning what you can do to ensure your listings appear in the search for as many Etsy buyers as possible. Good photos can make all the difference in how many views your listing receives. Buyers prefer bright and inviting photos where the product is showcased on a neutral background. Use the same background for all of your photos for a cohesive look. You’ll also need to find a great spot to take your photos. Avoid direct sun because it’s just too harsh. My favorite spots are right beside a big window or outside under a porch. Photography training can go a long way toward improving your photos. Taking time to learn a few basics like how to get the best light and how to edit your photos will make a huge difference. Check out my photography tips blog article to get you started. When you open an Etsy shop you’re starting a business. Running a business requires a lot of skills in areas that you may not be familiar with like marketing, shipping, customer service, and so much more. I know it can seem tempting to try to learn everything at once but just start with the essentials. If you’ve created a listing go ahead and research what you’ll use to package your order. Then figure out which shipping service you’d like to use. If you’re in the US I recommend using the US postal service. You can print labels right through Etsy at a discount. If you’re using USPS Priority Mail shipping you can even get free boxes. The more listings you have the better chance you will have of achieving consistent sales. 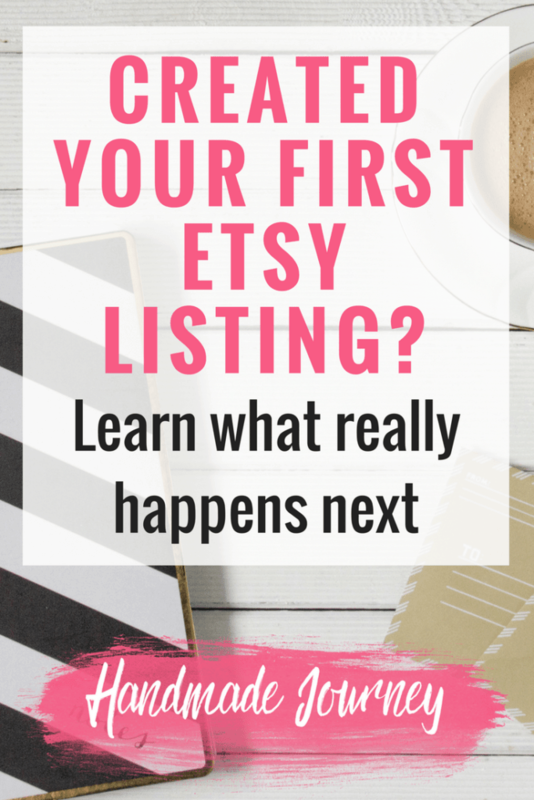 After you’ve created your first Etsy listing make a short term goal of adding 5-10 listings. It’s important to keep innovating and trying new things to see which products will do best for you on Etsy. Make a long term goal of getting to 50 listings. 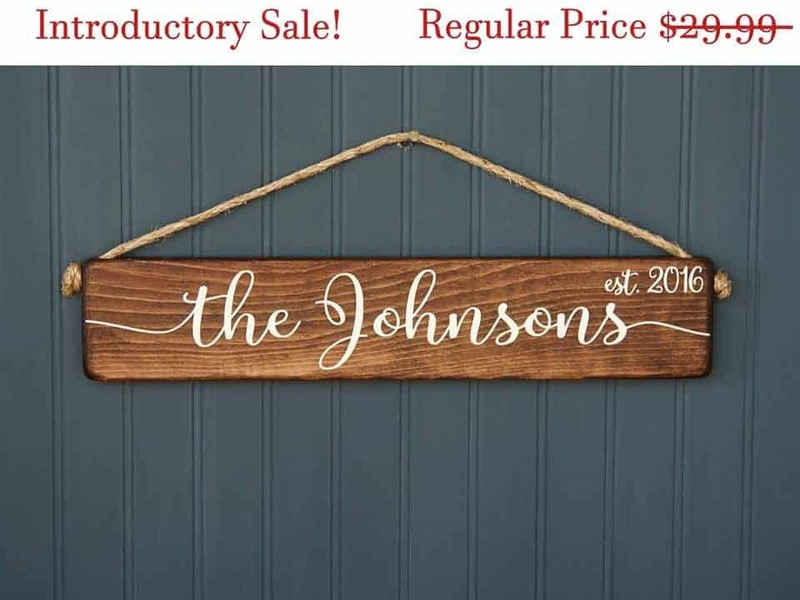 Many sellers report that they start to see consistent sales on Etsy when they get to 40-50 listings. Hang in there and focus on moving forward little by little. Don’t start out feeling like you need to tackle everything. This is your own handmade journey so don’t compare yourself to other Etsy shops. Just do what feels right for you and stick with it! Want some help with your SEO? 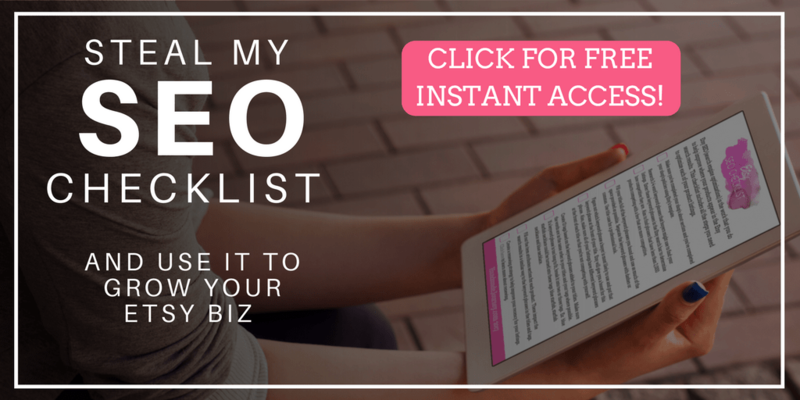 Click below to grab your free SEO checklist! Online shopping is by far one of my fav things to do. No long lines, I can multitask while I’m shopping, and the selection is endless. 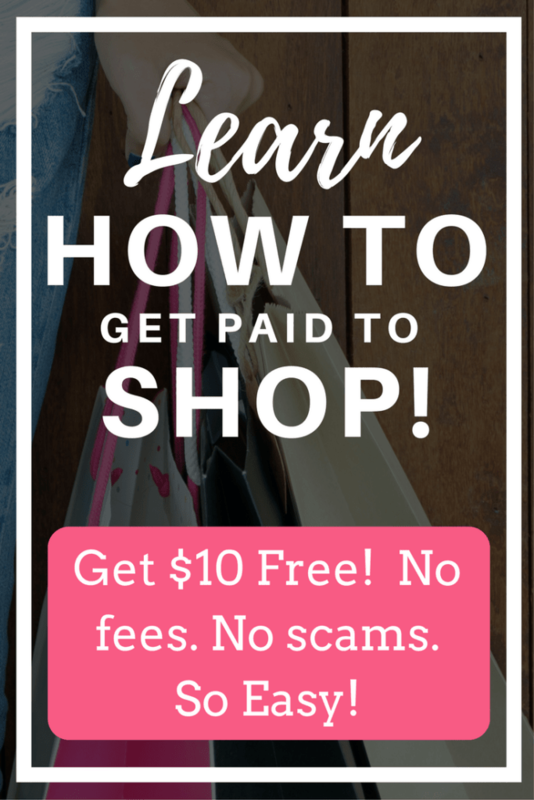 So what I told you that you could get paid to shop on Etsy and bunch of your other favorite online sites? Sounds too good to be true right?? That’s what I thought too until I looked closer at Ebates. I had heard about it years ago but never took the time to understand it and thought it was a scam. But I’ve done a ton of research and it’s totally legit! Ebates has affiliate relationships with thousands of online stores. When you purchase through them they get a commission and as an incentive to shop through Ebates they’ll pass on a portion of that commission to you. You’ll get a percentage of your purchase as cash back automatically. And your favorite stores are available within Ebates including Etsy, Amazon, Kohls, Fabric.com, and so much more! There are even travel sites in there like hotels.com, Travelocity, and Expedia. First, click here to create a free account at Ebates*. Second, use the Ebates website, app or browser toolbar to find stores you’re already shopping at. Third, go to the online store through Ebates and make a purchase. Fourth, you get paid! You’ll get a direct deposit or a big fat check every quarter! When you make your first purchase through Ebates they’re going to give you $10, just for making a purchase. It’s seriously the easiest $10 you’ll ever make. You’ll even get paid every time you refer one of your friends to Ebates. If you’re ready to sign up for Ebates, simply click the link below. It’ll take just a few minutes and you’ll be ready to start making purchases and getting cash back. Most people earn several hundred bucks every few months just from making purchases they were already making. *The Ebates links in this article are referral links. I only recommend products or services that I’ve used and love. Fall is my absolute favorite season. Pumpkin spice everything, sweaters, and no more humidity! 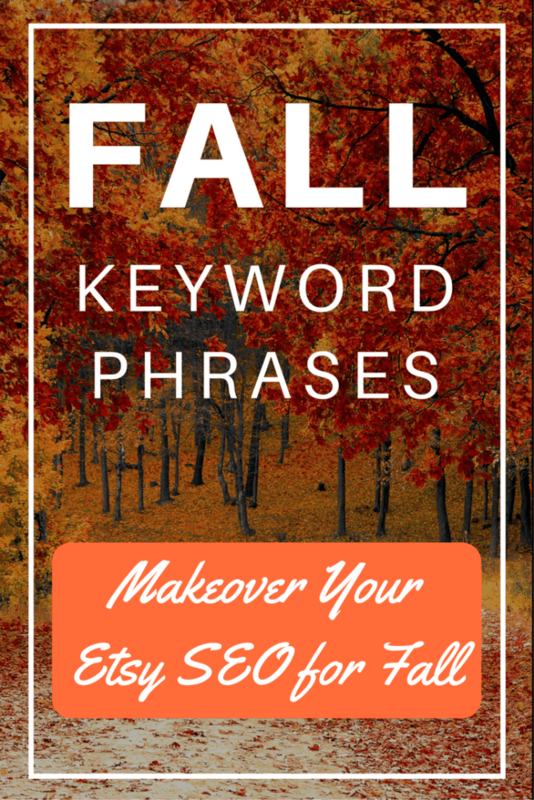 It’s time to start putting fall keyword phrases into relevant listings. To help get you started making over your listings for fall, I’ve created an Etsy fall keyword list for you. If you’re still struggling to come up with keyword phrases, you’ll love the resources inside the Handmade Journey Academy. Our members receive extensive SEO training, longer keyword phrase lists for every season and holiday, access to Etsy experts to get all of their questions answered, plus a whole lot more. The doors are opening again soon! Click here to be notified when the doors reopen. April of 2017 was the one year anniversary of my Etsy shop, Liberty Island Farm. I’ve had lots of ups and downs over the past year from selling shirts to selling wood signs, my husband’s motorcycle accident and a Christmas season that was amazing but so overwhelming. I wouldn’t trade any of it though. The Etsy life isn’t an easy one. I put a crazy amount of my time into researching Etsy, SEO, photography, social media, and more to help ensure my shop continues to provide for my family. It really is worth it to me though because I have full control of the creativity, the business, and most importantly, my time. 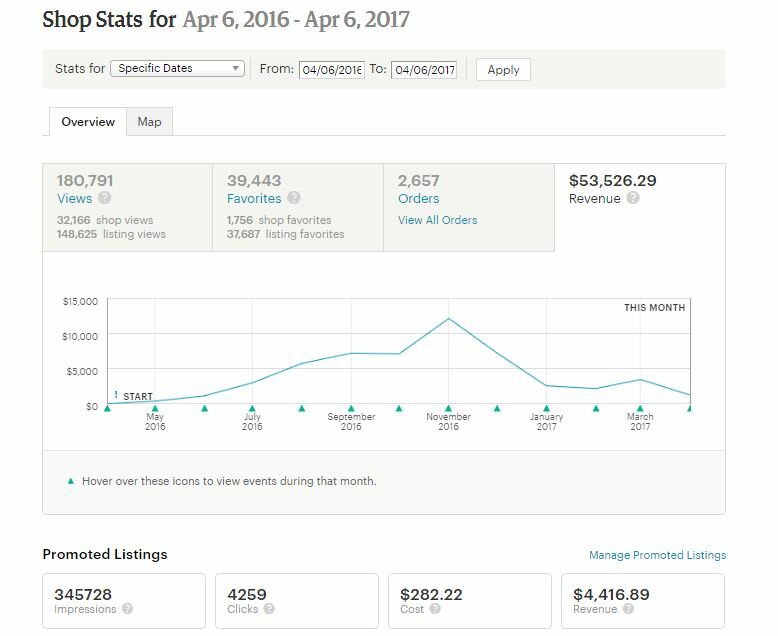 The photo above is my stats from Etsy from April 6, 2016 to April 6, 2017. I also included the promoted listings info which accounted for roughly 8% of my sales. I average around 70% profit margins so after you take out all of the Etsy fees and supplies I made around $37,000 profit before taxes. I grew or maintained my sales in every month of 2016 and had a really great Christmas season. I saved a big portion of our sales from our busy Christmas season because I knew that January and February were especially slow for retail and I was taking a week off in March to go on a cruise (which Etsy sales paid for). Planning for a rainy day is essential for retail sellers because you will have rises and falls in your sales. 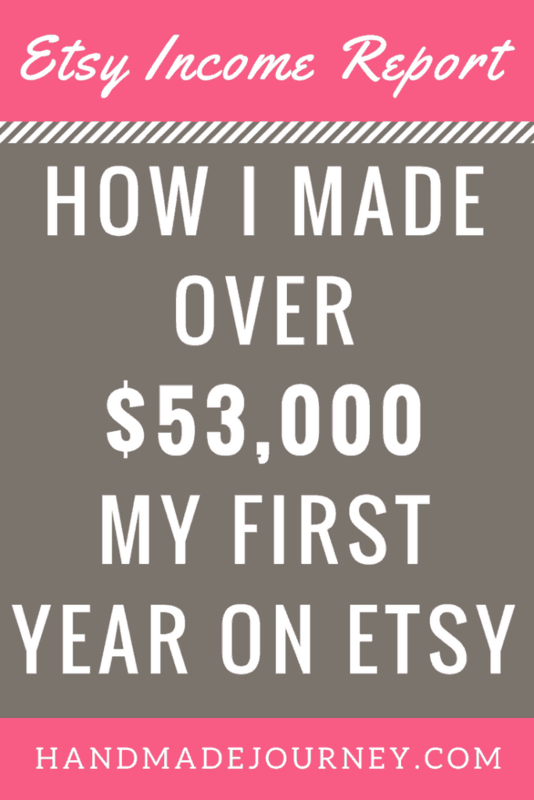 Thinking back to when I started, I remember how seeing Etsy income reports like this added fuel to my fire. If others could do it, I knew I could too. I knew SEO was important so I focused my attention there. And it turns out, SEO was THE key!! Before you focus on social media or photos or anything else, learn about and work on your SEO! I can’t stress it enough. SEO, which stands for search engine optimization is what determines whether your listings appear in the Etsy search results for buyers. If you don’t appear in the search results you won’t get any sales. If you don’t know what SEO is, click here to learn all about the basics. If you know the basics, click here to grab the free SEO checklist to help perfect your SEO. I made sacrifices to achieve this level of success. I learned everything I could. I was never too attached to my own idea of what would sell and instead, I focused on what my target market responded to. I completely switched up my product line based on what was selling well and had the best profit margins. I experimented and innovated every day to help move my business forward. I also attribute a lot of my success to good product photos, Etsy promoted listings, and EtsyRank which I started using early on to help me find the right keyword phrases. But SEO was definitely the most important area to focus my time. Now, in the next year of my business, I’m adding new listings to grow my Etsy shop, helping other sellers in my free FB community and I’m starting an online learning community for motivated Etsy sellers called Handmade Journey Academy. If you have any questions for me about Etsy come chat with me in the Facebook group. Ready to take your Etsy SEO to the next level? 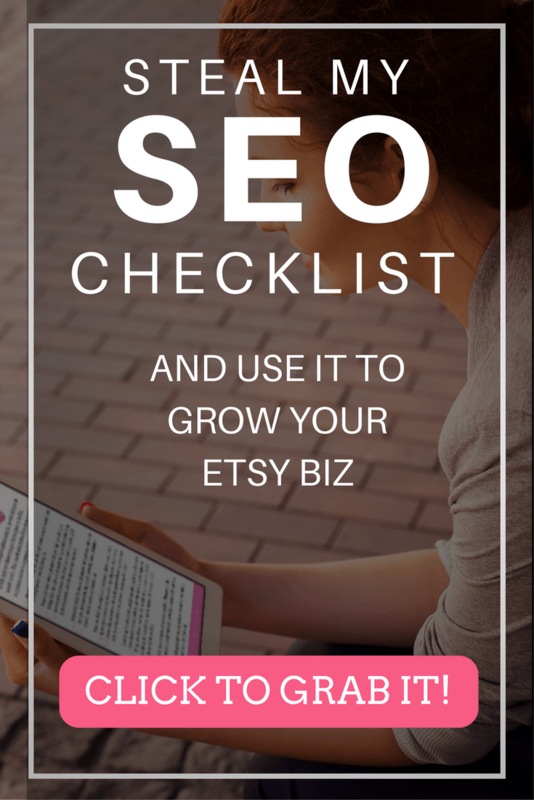 Click below to grab my Etsy SEO Checklist which will show you my step by step proven process to optimize your listings. Why is Etsy SEO so Complicated? Those numbers are super high. Etsy is growing at lightning speed. Almost 200,000 active sellers joined Etsy in 2016. That’s over 500 new Etsy sellers signing up every day. Buyers are becoming more aware every day of how corporations are taking over and they’re making a bigger effort to spend their money supporting small businesses. Also, when people are buying gifts, it’s harder than ever to find something unique that the recipient doesn’t already have. What better way to solve that problem than with a unique handmade gift? What does this have to do with Etsy SEO? All this means that Etsy needs to help buyers zero in on what they’re looking for. The number of products currently appearing on Etsy is staggeringly large. In May of 2016, there were over 35 million active product listings. Etsy is working to make a sale, otherwise, the buyer will leave unhappy and shop somewhere else. This means they need to present Etsy shoppers with products that are most likely to result in a sale. How do they do this? With a complex set of rules called an algorithm. These rules help determine where Etsy products will appear in the Etsy search results. Which factors make up the Etsy SEO algorithm? Etsy updated the search algorithm in September of 2018. The info below has been updated to include these changes. To learn more check out this page from the Etsy seller handbook. The words that a buyer uses to search on Etsy must be in the title and/or the tags or a listing won’t appear. If you have the phrase ‘blue necklace’ in your title or tags and a buyer searches for the phrase ‘blue star necklace’ your listing won’t appear if you don’t have the word star within your title or tags. This helps the buyer view only items that contain exactly what they’re looking for. Keywords entered in the attribute section of a listing are considered in the Etsy search results in a similar way to the keyword phrases in the titles and tags. These attributes are just another way to describe your items and will help buyers search in a different way in the future when Etsy adds search filters based on these attributes. Try to fill in as many attributes that are relevant as possible per listing and don’t use the exact phrase you’ve used in an attribute in your tags because you’ll already be appearing for that phrase. Keywords that appear in the category names of a listing are considered in the Etsy search results in a similar way to the keyword phrases in the titles and tags. Try to choose the lowest level category possible so that your listing will appear in that category and all above it and don’t use the exact phrase you’ve used in the category name in your tags because you’ll already be appearing for that phrase. Etsy looks at how well a listing converts—how many people view it and then make a purchase—to determine whether buyers are interested in it, which boosts that listing’s quality score and placement in search results. If you get a lot of views but not a lot of sales Etsy will see that people aren’t interested in your product. For this reason, I don’t recommend playing favorite games that are popular on Facebook or sharing your product with groups that likely aren’t your target market because they result in empty views. Reviews have an impact on the search results. Great reviews will give you a boost in the search and negative reviews will hurt your shop’s ranking. This helps reward shops that are delighting their customers. Having a completed about section and a completed shop policies section using Etsy’s provided template will give you a slight boost in the search results. This helps reward shops who have taken the time to properly set up their shop. Recent cases opened against your shop or any past reported intellectual property infringement listings will have a negative impact on your search engine ranking. This discourages poor customer service and the trademark or copyright infringement. (Things like using words or phrases from a movie, tv show, sports team, song lyric or directly copying another seller’s work). To help keep the search results fresh and to give new products a chance, recently listed or renewed products will be given a small temporary boost in the search results. This temporary boost can last anywhere from a few hours to a few days, depending on how often people are searching for a particular item. Regularly renewing your items or creating new listings just to get this small boost isn’t an effective search optimization strategy. To encourage Etsy sellers to keep shipping prices as low as possible Etsy search factors shipping price into search ranking to make it easier for shoppers to find listings with competitive shipping prices. Listings with lower shipping prices are more likely to rank higher in search. When you set up your shop on Etsy, you choose a shop language. The titles and tags you add to your listings should be in the language you choose during setup. Etsy will translate your keywords and show shoppers results that match their query and language settings. Etsy also customizes the search results to specific shoppers. Their Context Specific Ranking technology learns what buyers are interested to show them the items they’re most likely to purchase. When you search on Etsy, what you see isn’t always what another buyer might be seeing. Searching for your own listings and comparing the results over time or across devices isn’t an effective way to determine where your listings are appearing in search, since the results you see are just a small slice of a much bigger picture. 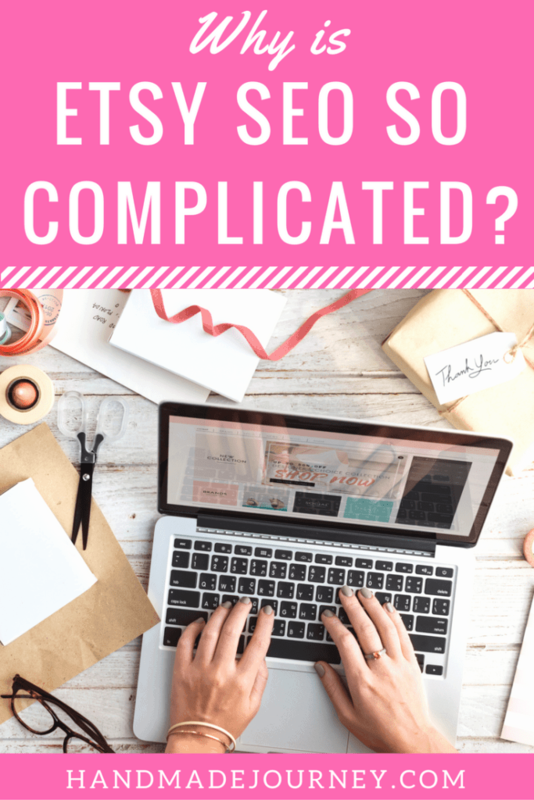 But why does ETSY SEO need to be so complicated? Etsy truly is doing their best to help buyers find products they are looking for and to capture a sale. I think all handmade sellers would agree that it’s important that buyers are presented with items that they are most likely to purchase. This means that a fellow Etsy seller has a better chance of receiving a sale. The alternative is that the buyer getting frustrated and leaving Etsy to shop on a site where a corporation will receive all the profits. The Etsy SEO search algorithm helps ensure the future of all of our handmade businesses by giving the Etsy buyer a great experience that ends in a sale. So how can I get my products to appear in the search results? I know all the factors above can be extremely overwhelming and seem unnecessarily complicated. It would be so amazing if we could join Etsy, quickly add a few listings and make some sales. But rarely in life is something worth doing so easy. It requires research and effort to succeed in an ever expanding online retail space. The competition is intense! Hundreds of new Etsy sellers are signing up every day. It’s possible to stand out among the competition but you have to put some work in. Fortunately, this blog, as well as the Handmade Journey Academy will save you time and effort by giving you my tested Etsy SEO tips and tricks. The first place I recommend that you start working on SEO is in your titles. It’s the most efficient and effective way to start seeing results in your Etsy shop. Check out this blog article that has all the tips you need to construct Etsy product titles that will help you get found in the Etsy results. Once you’ve worked on your titles and your tags, the next area to focus on is your photos. Having great photos is the key to getting views and sales. Want even more help optimizing your listings for Etsy SEO? Disclaimer: The above info is what has worked really well for me in my experience of running a successful Etsy shop. While it has worked for me, you may experience a different result. Make changes slowly and be sure to save any previous information you are replacing in case you find that your previous choices worked better for you.